Click on the image above to go to this interactive map [Requires Flash]. 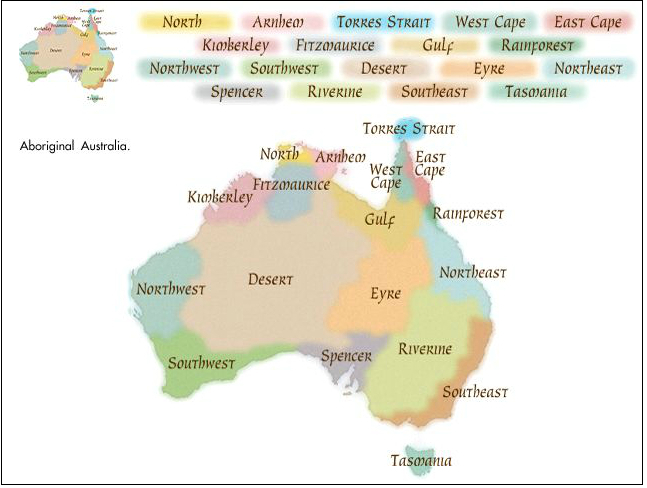 Select each heading (at the top) to investigate the original Aborignal and Torres Strait Islander territories. 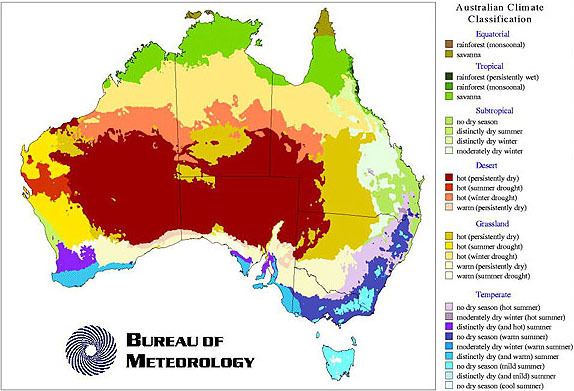 SOURCE: Bureau of Meteorology, URL: http://www.eoc.csiro.au/hswww/koppen.jpg. Quiz: How much do you know about Australia's early history? Who are the indigenous people of Australia? 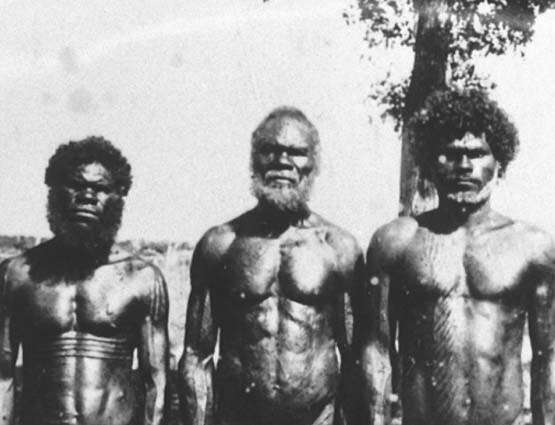 The indigenous people of Australia are the country’s earliest native inhabitants. The word indigenous means native. Australia’s indigenous peoples include the Aboriginal peoples of Australia and Tasmania, as well as the Torres Strait Islander people. Historians believe the Aboriginal people of Australia are descended from people who arrived in Australia from Southeast Asia at least 50,000 years ago. 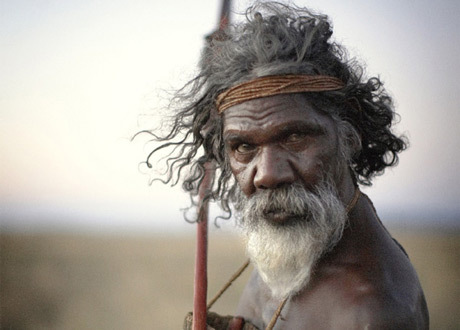 Indigenous Australians believe they have always lived here, and that they were created by spirit ancestors. By 30,000 to 25,000 years ago, they had spread throughout the Australian continent. There were probably from 500,000 to 1 million Aboriginal people living in Australia when European settlers first reached the continent in 1788. They are sometimes call aborigines, a name give to them by the early white settlers. It is a Latin word meaning "from the beginning." The Aboriginal people of Tasmania are descended from Aboriginal Australians who arrived on what is now the island of Tasmania at least 35,000 years ago. Tasmania lies to the southeast of continental Australia. At that time, a land bridge connected Tasmania to the Australian continent. By about 8,000 years ago, sea levels had risen and covered the land bridge. Tasmania became a separate island. The Aboriginal peoples of Tasmania became isolated. The Torres Strait Islander people are descended from people who settled the Torres Strait Islands as many as 9,000 years ago. The Torres Strait separates northern Australia and the island of New Guinea. Each different group, or 'mob,' such as the Eora, Yari-Yarit and the Noongar, has its own language. Some groups are small while others include hundreds of people. At one time, Aboriginal people in Australia lived by hunting animals and gathering plants. They moved from place to place. Tribes were divided into smaller groups that hunted and gathered food together. Families were very important. When British people first arrived in what is now Australia in 1788, about 750,000 Aboriginal people lived there. Many early settlers treated the Aboriginal people badly. Some were killed, and many died of diseases carried to the continent by the British. Today, there are about 464,000 Aboriginal people in Australia. Most Aboriginal people now live in towns. Many of them are not treated fairly. They often cannot get good jobs, a good education, or a decent place to live. Several Aboriginal groups have regained some of the land that once belonged to them. In 2008, the government of Australia apologized to the Aboriginal people for past injustices. SOURCE: 'Aboriginal people of Australia' 2016, World Book Kids, World Book, Chicago, viewed 21 Mar 2016, http://www.worldbookonline.com/kids/home#article/ar830159.